This week, my friend and I waited for Chicalicious (dessert place) on 10th Street east of Second Avenue to open after having a great lunch at iPuddo. As we knocked on the door as they were scheduled to open, we ran into their photographer taking photos of the new foods to be added in their menu, particularly those they would serve at the new Treehaus on Third Avenue in midtown. I was so delighted that they will be supplying Tree Haus my favorite hard to find pastry from Brittany, called kouign-man (pronounced kunya-man). But they say it king's man because it would be difficult for a non-French speaking person to pronounce it. I guess it's like saying crescent for croissant (pronounced: cwasong). Straight from their pan, on the left is their new chocolate and almond kouign-mann. I bought these samples to try them. And yes, they were delicious. 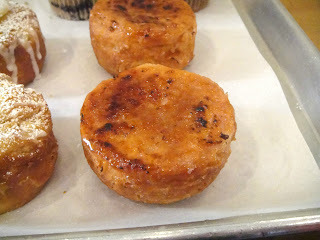 Above is what they call kouign-mann brulee - but to me, it tastes more like the traditional kouign-mann I had in Brittany when we visited. ******Kouign-amann (pronounced [,kwiɲaˈmɑ̃nː] (kween a-mon), Breton pl. kouignoù-amann) is a Breton cake. It is a round crusty cake, made with bread dough containing layers of butter and sugar folded in, similar in fashion to puff pastry albeit with fewer layers. The resulting cake is slowly baked until the butter puffs up the dough (resulting in the layered aspect of it) and the sugar caramelizes. The name derives from the Breton words for cake ("kouign") and butter ("amann"). Kouign-amann is a speciality of the town Douarnenez in Finistère, in the west of France, where it originated in around 1860. Chicalicious will be providing these delicacies at the upcoming Breakfast or Brunch place at Treehaus. Additionally, they will also be serving a breakfast treat: Croissant with a 7 minute egg inside peeking out. The Chef from Chicalicious providing these French pastries or inspired pastries used to be a chef for Laduree in Paris! It's no wonder why they're scrumptious! I just can't wait for them to open. It is scheduled to open on January 8, 2013. That's this Tuesday!! I've been to Treehaus a number of times. Yes, food is upscale buffet weighed at the end. However, my Kouign-mann is still not available. I have now emailed them to carry it. What do you know! I received an answer from Treehaus that they'd be carrying my favorite rare treat from Brittany made by Chicalicious - Kouign-amann. They'll be carrying it starting next week - Wednesday February 27.